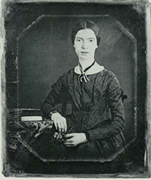 The following links provide resources to support high school students' investigations into the work and life of Emily Dickinson and selected musical compositions. "Emily Dickinson -- Death," Lilia Melani, Department of English, Brooklyn College - This page includes an analysis of the poem and specific information about the 4th stanza. "Emily Dickinson" - The Wikipedia has a lengthy article on Emily Dickinson. You MUST always verify Wikipedia information in other sources. The Wikipedia has articles about all three composers or pieces of music. Berlioz's Marche au supplice ("March to the Scaffold") - You will find information about the composer on this page. There is also information about the Symphonie fantastique, Op. 14. Search the page for "supplice." Cherubini's Requiem - Search the page for information about the "Requiem." There is also a link to a brief mention of the piece, Marche funèbre. Consult with your school librarian. Which of these pieces of music best captures the tone of Dickinson's poem? 1. Evidence from Dickinson's poem, your background knowledge or research, and response to the poem. 2. Your background knowledge and response to the poem and the music. 3. Your inferences (evidence in the texts plus your background knowledge) about the tone of both pieces, the poem and the music. 4. Your research on Emily Dickinson, the poem, and the musical selection you chose. As provided by your school, public, or state library. Recommended database: Literature Resource Center (Gale Group). "Emily Dickinson." Wikipedia. 27 Dec. 2010. <http://en.wikipedia.org/wiki/Image:Black-white_photograph_of_Emily_Dickinson2.jpg>.